Saint David’s property came into being via the generous donation of the homestead, including approximately five acres of land, by Judge and Mrs. Billings Crandall in 1962. The Crandalls were not Episcopalians, but they wanted their estate to be used in a non-profit way for the good of the community. They were very happy to see Saint David’s as growing asset to Gales Ferry. The original church building (now the Parish Hall) was rapidly built and dedicated in October, 1963. The present sanctuary was constructed and dedicated in September, 1966. The Billings house, across the street at the corner of the property, being unusable for a rectory, was altered and used by the Connecticut Diocese for several years. Eventually the house and surrounding land were turned over to the United Way organization as their headquarters for Southeastern Connecticut; thus maintaining appropriate use of the Crandall estate. A major renovation and new construction of our building was undertaken in 2009, following an all-parish appreciative inquiry, which determined that we needed larger and modernized facilities. 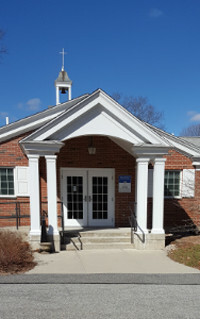 The renovation and construction (a 1.5 million dollar project) has resulted in our current building, which includes the sanctuary and sacristy, Rector’s office, administrative office, Christian Education office, library, nursery, seven classrooms, music room and office, gathering space (with kitchenette), large commercial grade kitchen, parish hall, four restroom facilities, and expanded parking lot. The property expansion/modernization required us to undertake a capital campaign to raise the funds. As of 2018, we have $65K of loan repayments that are included in our annual budget for the next several years.